How Scientific Study Of Pranayama Can Help Improve Health. – A contraindication is a specific situation in which a procedure, should not be used because it may be harmful to the person. a) Physical changes b) How the yoga will affect the daily routine c) The treatment of the various infirmities. d) Precautions while practicing the yogic postures. In general, practice the Pranayama three hours after any meals. Always breath in when the lungs get into the expanded position from normal, when bending sideways or twisting away, backward. 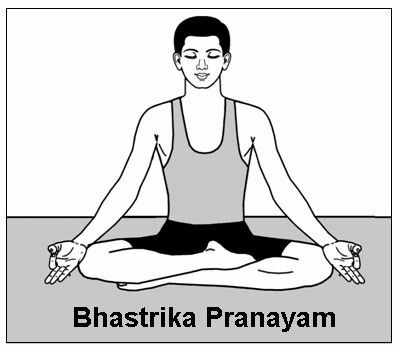 This Pranayama is best practiced for three to five minutes. The best results are obtained when the Sadhak ( performer ) thinks that the active, vital force, purity, calmness and happiness prevailing in the universe is guiding and entering the body. While keeping the backbone and neck in the erect position and in a line. Start breathing heavily using both the nostrils – in and out alternately. The duration of the time should be same. Three different speeds are to be used: First for healthy fast in and out of the breath, second, with medium speed. Third, for those with heart problem should perform slowly Purak: Inhalation of breath; Rechacka: Exhalation of breath. The reflex action improves in time as is required in the jobs of the commandos, sportsmen, and members of armed forces. Do not ever stop taking medicines without medical advice. It is high-frequency yoga breathing. The breathing frequency should not be more than 60 number per minute. Kapalbhati means shining forehead. It is a cleansing technique where it sharpens the intellect. As always all breathing exercises are to be practiced with the backbone and neck to be in erect position, with eyes closed gently. On breathing the lower abdomen moves in and forceful periodic nostrils blows are given out without taking any breath inside. It is conscious one-way street, the fresh air goes into the lungs due to the vacuum created, and all the foul air or carbon dioxide gets expelled consciously. One minute’s rest after each 5 minutes of kapalbhati pranayama. The nervous system, energy output, brain blood flow, and effect on the heart are mainly affected. DURING the kapalbhati: When EEG is taken following brain waves are noticed.Theta and Beta waves increase. But AFTER the kapalbhati Alpha and Beta activities go down.That means that during Kapalbhati the intellectual state remains alert but relaxed. The involuntary system of blood pressure and food digestion kept running but affected by the kapalbhati in the following manner. The sympathetic nervous system keeps the body ready to meet the challenges that is, to save oneself or face the danger squarely. If the sympathetic nervous system works for any unusually long hour, the element of tiredness and stress start to play on the nerves. The parasympathetic system gets the usual functions of the body to work without any control.Here, when the system is working the body is not alert. Over activeness here results in diseases of the body, such as bronchial asthma and peptic-ulcer. A balance is necessary between both parasympathetic and sympathetic systems. Tells us about the flexibility of the heart. That is when the body works or not at rest the heart goes up. Having a greater variability of the heart, one is enjoying good health. It indicates a good balance between both autonomous systems. Kapalbhati does not affect the cardiac health of ordinary people. Kapabhati increases the Strength Output and, therefore it helps in reducing weight if practiced in the right way. Kapalbhati does not increase the blood supply to the brain. Hence, there is no chance of brain stroke. Kapalbhati can control obesity and diabetes: On regularly performing Kapalbhati, both hypertension and diabetes remain under control. Therefore, BP and sugar level should periodically be checked. Kapalbhati manages and is useful for the slow learner. a) Keep the backbone and the neck in an erect position. It is like old times ironmonger bellow, start by exhaling through both nostrils.
. One has to inhale from the left nostril while the right one remains closed with feeble pressure.
. After the breath is in, the left nostril is closed, and exhaling gets done through the right.
. Now the inhaling is through the right nostril and then close the right nostril and exhale through the left nostril. .One cycle is complete, and the process is continued. – Blood pressure: The blood pressure reduces considerably when this Pranayama gets practiced more than 20 minutes. – Memory Scores: Experiments indicate that spatial memory ability improves significantly. Although, it is concerned with the music, art, and literature and should be practiced by young students. – Attention: the selective memory and visual memory for the computer gets enhanced. – Muscle strength gets increased due to glucose oxidation of the muscles as anulom-vilom practiced for 20 minutes. 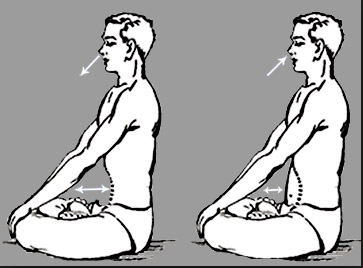 Anulom-Vilom Pranayama should not be practiced when tired. It has no side effects or harmful in any way. As usual in the case of the performance of yoga, sit upright in a comfortable posture in any of the sidha asan, lotus posture or vajra asana with backbone and neck in the same line. 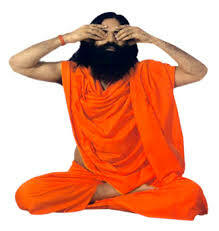 Eyes remain closed while breathing, with index fingers on the forehead just above the eyes brows. Remaining three fingers on the eyelids placed very gently and just next to the nose, both the thumbs are gently shutting the ear by pushing the protruding ear lobes. The outside noise will be almost shut. Breath in through the nose. Breath out while humming the word OM, making the noise like a bumble bee. The vocal cords get positioned close when humming sound like bumble bee is made.The vocal cords are positioned closly when humming noise is made. Pulse rate goes down while metabolites of adrenalin and nor-adrenalin (norepinephrine) go down. It is found useful in case of stress management or situational anxiety related. It is presumed to be helpful in Anxiety neurosis and panic disorder. 1) sit erect with backbone and neck in line. 2) Exhale as much as possible through the nostrils. 3) Touch the chin to upper chest. 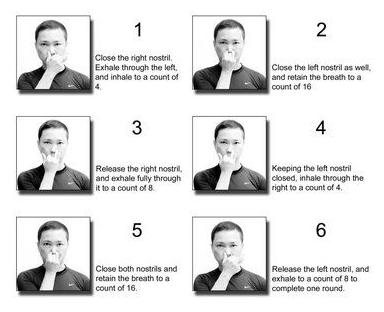 5) Hold the breath as long as possible comfortably. When the breath holding time exceeds the breathing in or out, it is natural to consume lesser oxygen found to be 19% less. The decrease of oxygen consumption reduces the stress thus prolonging the life span. In the case, the holding breath time is lesser than breathing in or out, the oxygen consumption increases by 52 %. One ‘s experience gets to be decreased in stress- related arousal. Perhaps the degenerative changes related to aging get reduced. It is speculated that Metabolic syndrome, Overweight, and type II diabetes may be treated by keeping 2:2:1 —inhale, exhale, hold. Practicing Bahya Pranayama, ensure that no hypertension, CAD ( Coronary Heart Disease), No recent Chest cavity or abdominal surgery has taken place. Also no pelvic or abdominal diseases are present. By experience side effects and complications are rare, always consult the medical doctors, take utmost care and all risks are to be avoided, and most important do not reduce medicine without proper consultation. Udgitha is a Sanskrit word meaning an excellent traditional chant where the first syllable( part) is voiced in a prolonged way. That is oooo and mmm is short. This is one round to be repeated three times. The pulse rate goes down, and breathing rate as well goes down. Oxygen consumption decreases. It also means that udgitha reduces the stress and anxiety. The concentration level is increased for Sea pilots, Drivers, Defence personnel on watchmen during observation and the sportsmen. The stress is certainly reducible in various walks of life. There are no side effects or any conditions to be avoided while practicing this pranayama.